NEW YORK CITY — A proposed high-rise apartment building on the present site of a vacant 100-year-old East Village church could desecrate the dead, preservationists said at a Wednesday afternoon rally. 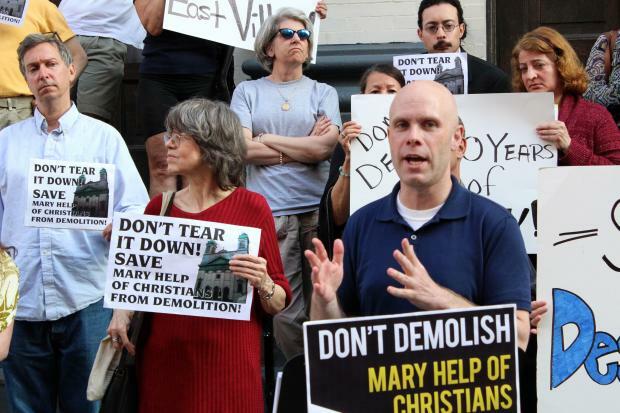 Burial plots that may remain under Mary Help of Christians Church on East 12th Street and First Avenue would be disturbed if developer Douglas Steiner’s proposed project goes forward as planned, according to the Lower East Side Preservation Initiative and other historical groups. The church was formerly the site of the Old St. Patrick’s Cathedral cemetery, where thousands were buried in the early 1800s, the historians said. In 1909, most of the graves were moved to Calvary Cemetery in Queens, but the groups believe that some plots remained. About 30 to 40 preservationists gathered Wednesday as bagpipes played and chanted "Don't Tear them Down" while holding signs that read "Don't Destroy 100 Years of History" and "Why demolish when you can preserve." They are calling on the city to do a search for remains before the project moves forward. The groups already lost a bid to have the city preserve the buildings, which include the church, a school and a rectory, as landmarks. While a date has not been set for demolition, permits have been approved with the city's Department of Buildings, according to its website. “We therefore call for a thorough archeological study to be completed before any construction or demolition takes place to discern if there are human remains buried on this site, to ensure that no bodies are disturbed by construction or demolition on these sites,” Andrew Berman, executive director of the Greenwich Village Society for Historic Preservation, wrote in a letter with the other groups to the developer and the city. "It has happened before at the SoHo Trump," said Berman later at Wednesday's rally. "The city intervened with that." In 2006, Donald Trump was ordered to temporarily halt construction on the 46-story building when human remains were discovered, according to the New York Sun. Berman said it was unclear how many bodies had been buried and removed. He referenced the book The Catholic Cemeteries of New York which stated that almost 40,000 bodies had been buried in the spot. Berman then cited a New York Times article published in 1907, stating that there were 3,000 bodies and many had been removed after the cemetery's closure in 1833. Berman said the groups hoped that Steiner would use a large lot beside the church and rectory to build the high-rise and incorporate the historic buildings into the project. “It would be a tragic waste and shame if these beautiful buildings, so full of New York’s history, were demolished for expediency’s sake, " he said. Manuel Albino, 39, a former parishioner at the church before it shut in 2012 said its congregation shepherded a multi-cultural population when it was operating. "These are buildings that express love, love of God… love of neighbor…," Albino said. "Please Mr. Steiner let this testament of love continue to inspire the neighborhood," he said. A spokeswoman for Steiner declined to comment.